The need for radical voices has never been more pressing. Defending voices that are being silenced is a task for all of us. When Philando Castile’s killer, Officer Jeronimo Yanez, was found not guilty on Friday—despite the fact that Castile’s murder was livestreamed on Facebook—shock immediately spread from the streets to social media. Some celebrities in the world of sports and entertainment used their expansive platforms to spread the (rather self-evident) message that a great injustice had occurred. They decried the fact that a man had been killed solely because of a police officer’s reaction to the color of his skin, and there would be no penalty for that killing. But one athlete expressed something more serious, more radical, and more fitting for a political moment where, to quote Naomi Klein’s new book, No Is Not Enough. Beneath those words, he posted a photo of two eerily similar badges: one, from the 19th century, reads runaway slave patrol and the other, from the 21st century, reads police officer. It was a bracing statement that spoke to our effort to understand how the courts seem to have decided that cops have a license to kill if their victim is black. It was also a reminder that political expressions like this are precisely why Kaepernick is still without a job. 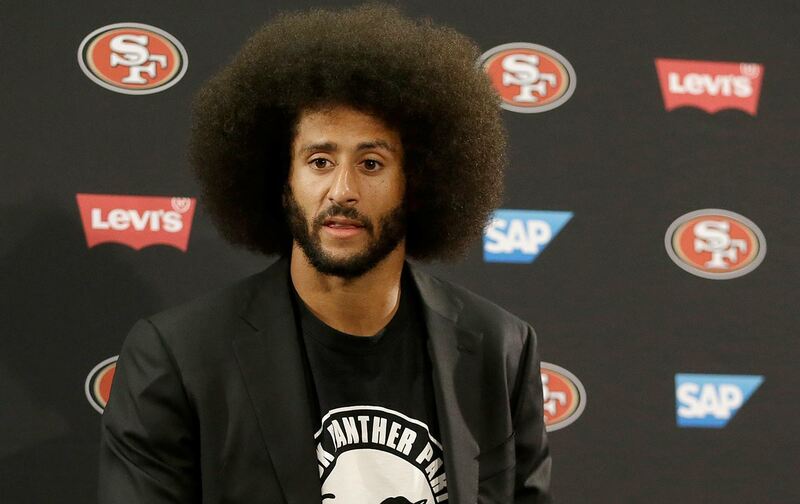 NFL owners are set on punishing him for his anthem protests, his Know Your Rights Camps that teach young people “how to navigate oppression,” and his social-media postings. He wants us to confront the gap between what this country purports to stand for and the lived experiences of black Americans. For NFL owners, agitating for the dignity of black life—unlike spousal abuse, drunk driving, or even murder—is unacceptable. Quarterbacks with one-tenth of Kaepernick’s résumé have been invited to training camps, while he and his spectacular 2016 4:1 touchdown-to-interception ratio remain at home. It’s a blackballing, and to deny this is to deny the existence of the nose on your face. It’s having someone spit in your eye and tell you it’s raining. This is absurd and utterly at odds with the facts. It is also Roger Goodell performing his central job: being “a flak-catcher,” the face to get punched, when his 31 bosses behave in repugnant fashion. It would be so much better if Goodell would stand up to them and tell the world the truth: that Kaepernick is being punished for his politics. It would be so much better if he had half the backbone of his father, Senator Charles Goodell. Charles Goodell was a Republican senator from New York, appointed after Robert Kennedy’s assassination in 1968. Charles Goodell was something alien to today’s Washington, DC: a Republican of conscience. He made President Richard Nixon’s enemies list by becoming the first person to propose legislation that would cut off all funds for the war in Vietnam. After being driven from office by the Republican establishment, he wrote a remarkable 1973 book called Political Prisoners in America. The book is about the importance of defending dissenters as an essential part of American democracy. Charles Goodell wrote, “I have come to see that our legal and political institutions are dangerously unresponsive and unyielding to the impassioned grievances of our own people…. When words of appeal fall upon a seemingly inert system, words give way to action.” He passionately argued that squelching dissent is an autocratic act, at odds with democratic norms. He also wrote that the actions of people in power resistant to dissent are insecure in their own ideas, and their inability to see the world through the eyes of others is a sign not of strength but weakness. These words of Charles Goodell from 44 years ago could have been written today to describe the situation with the NFL, Colin Kaepernick, and Goodell’s son. They also speak to the the importance of defending radical athletes with giant platforms in an era when Philando Castile’s killer could somehow be found not guilty. Roger Goodell doesn’t have to agree with Kaepernick, but he could be defending Kaepernick’s right to not be exiled and prevented from making a living. If the NFL commissioner disagrees with me, I know a book he could read that might change his mind.